I'll start off with a review of the new films I saw in the cinema this week, then move on to a quick recap of everything else. 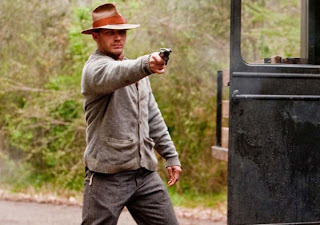 Lawless is the latest picture from Australian director John Hillcoat. I was a big fan of his previous effort, The Proposition, and am pleased to be able to report that this one is similarly successful. Set in the rural American South during the Prohibition era, it's the story of the Bondurant brothers, who have been manufacturing moonshine for some time with the tacit co-operation of the corrupt local sheriff. That all changes when a cold eyed Special Deputy named Charlie Rakes moves into town, demanding a cut of the profits for himself... There are no real 'good guys' in this film - just about every character is morally compromised to some extent - but next to the cold and sadistic Rakes, the Bondurant brothers are veritable saints. The movie is beautifully shot, with gorgeous cinematography showing the changing seasons of Franklin County, Virginia. There's also an impressive cast, including the likes of Tom Hardy, Guy Pearce, Shia LeBeouf, Jessica Chastain and Mia Wasikowka. Nick Cave, who provided Hillcoat with a brilliant screenplay for The Proposition, comes up trumps again here with another strong script, whilst also providing a number of songs for the soundtrack. Just a couple of minor quibbles; firstly, Gary Oldman's character, a Chicago gangster, is introduced in grand style, but is then pretty much absent for the rest of the film. Secondly, I wasn't completely convinced by the climax to the movie - I felt that for such a memorable villain, Rakes doesn't really get the send off he deserves. Anna Karenina sees director Joe Wright team up with lead actress Keira Knightley for the third time in their respective careers, with a slightly unusual adaptation of the classic Russian novel. I have to confess that I'm not normally a huge fan of costume dramas/ classic literature adaptations, but having awarded Wright's previous film the prestigious title of 'Kirk's Film of the Year', I thought I should check this one out. The twist that Wright puts on this adaptation is that a significant proportion of the film has the actors appearing on stage in a theatre, but this technique was only used for certain scenes in the story - at other times, the action was shot in open air. While this was an interesting idea, I wasn't 100% sure what the director was getting at by doing this. I also felt that the film to be slightly over long, and I found that it started to drag a bit towards the end. Keira Knightley, Jude Law, Domnhall Gleeson and Matthew MacFadyen all turn in good performances, though I was less impressed with Aaron Taylor-Johnson. Moving on to the best of the rest, I saw two movies this week which were both up there with Lawless as contenders for my pick of the week. Wild Bill was an unexpectedly moving debut feature from Dexter Fletcher. The story of an ex-con returning to his home in East London and determined not to reoffend, the film has a lot of heart, some believable and memorable characters, and fine performances from Charlie Creed-Miles (as Bill) and young actor Will Poulter (as his eldest son). Also very good was Ringu, the Japanese version of the hit Hollywood horror film The Ring. As I'd already seen (and enjoyed) the remake some years ago, there weren't any massive shocks or surprises in watching the original. However, I reckon the Japanese version is a slightly superior film - the start and finish of the movie are very tense, there's a consistently creepy atmosphere throughout and the soundtrack is eery and unnerving. In the 'good, but not great category', we have Fletch, a Chevy Chase comedy vehicle from the '80s which is very much of its era, though there are still a few laughs to be found. Finally, I watched The Hand that Rocks the Cradle, a competently made cuckoo-in-the-nest thriller about a vengeful nanny. It gains marks for Rebecca de Mornay's performance as the plausible but diabolical villain, but loses them for a rather embarassing turn from Ernie Hudson (the fourth ghostbuster himself), who plays a simple minded handyman in much the same way as Ben Stiller's character in Tropic Thunder played 'Simple Jack'. To me, what's more interesting than the film itself is the career of its director, Curtis Hanson. He helmed one of my all time favourite movies, L.A. Confidential, which I think is an absolute masterpiece, but other than that, his resume is decidedly spotty. Other than Wonder Boys and 8 Mile (both of which I would regard as solid, but not amazing films), most of his other stuff is pretty mediocre. It just makes you wonder why it all came together for him so wonderfully on that one picture, and why he was never able to fully replicate its success elsewhere. 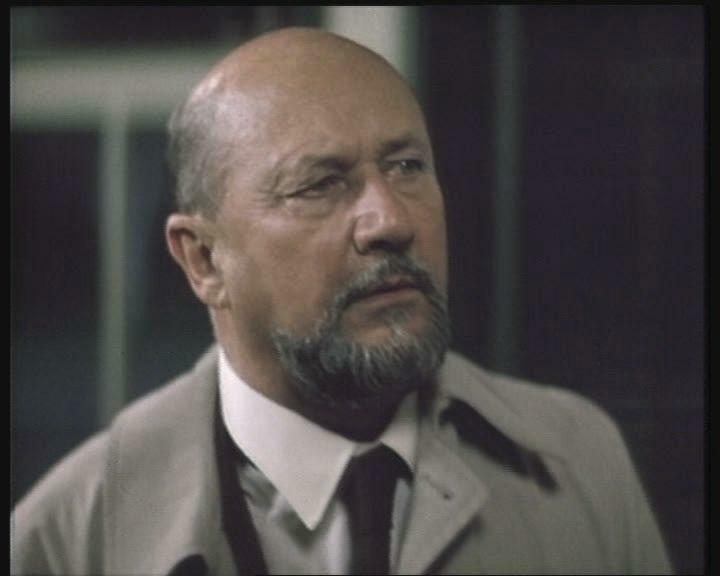 Dr Samuel Loomis: "I met this six year old child with this blank, pale, emotionless face, and the blackest eyes, the devil's eyes. I spent eight years trying to reach him and then another seven trying to keep him locked up because I realized that what was living behind that boy's eyes was purely and simply evil... He's been here once tonight. I think he'll come back. I'm gonna wait for him."